Alarm doesn't work. Devan gives me a call. Off to New York. Obligatory Instagram photo. Apple music shuffle. Fruit and yogurt at Starbucks. The road without tolls. No traffic. In the city early. Traffic at St. Marks. Trying to find parking. 10am pickup. Confusing Hotel numbers. Air conditioning. Gallery walk through. Le1f. Devan wants a shirt. Heading to Soho. BBQ bao. Hot humid weather. Man in all leather. All Saints. H&M. Fanelli Cafe. Meatball pasta. Not enough meatballs. Devan's server best friend. Looking for interesting people. Lady in mesh stockings. Walk back to the hotel. Two undergrads. Specific hair. Quick change. Tight black jeans. Opening. Meeting people. Alexandria. Emmy. Sarah. Dominic. Tim Hoyt. Danny. Girlfriend. Lance. Emily Miller. Devan has a video in the back. Gray makes an entrance. See-through black shirt. Beverly's. Getting carded as usual. Lagunitas IPA. 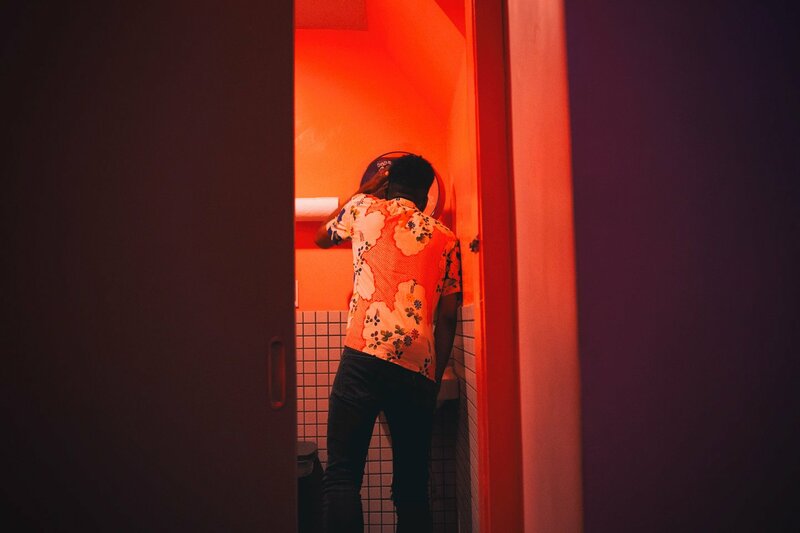 Colorful bathroom. Kyle's name. People heading out. Two more mixed drinks for the night. Friendly bartender. Everyone has a cool button down. The Great Frog. 2 Bros Pizza. X-men on TV.